someone with a new way of thinking. 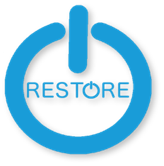 Dr. Grass founded the Ketamine Research Institute to pioneer the development of RESTORE Infusion Therapy. 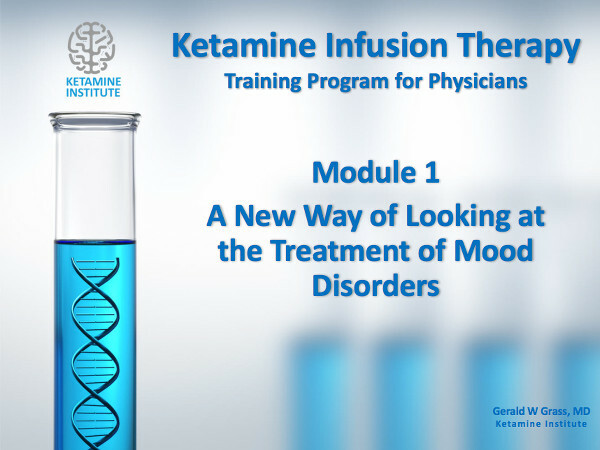 This unique ketamine based infusion protocol represents the next generation and advancement in the rapid, safe and effective treatment of depression, anxiety, PTSD and chronic pain. We know that we need to view complex illness as the result of "system reorganization" within the mind and the body. What we currently know about medicine is only the beginning, the mechanistic view. We understand that is vitally important to incorporate a broader view by including discoveries in memory, learning theory, and neurocognition if we want to make true progress. 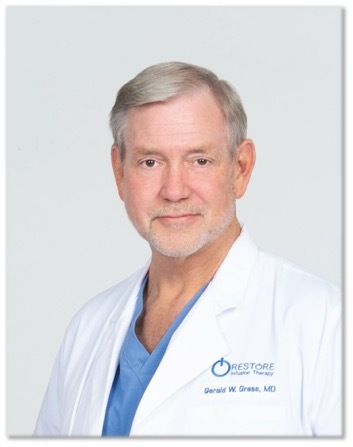 Gerald W. Grass, MD is an internationally known and respected physician who has pioneered the development of the RESTORE Infusion and has established Ketamine Infusion Physician Core Training, the first international training program for physicians in the use of ketamine to rapidly alleviate treatment resistant mood disorders and intractable chronic pain. State University of New York at Stony Brook School of Medicine. 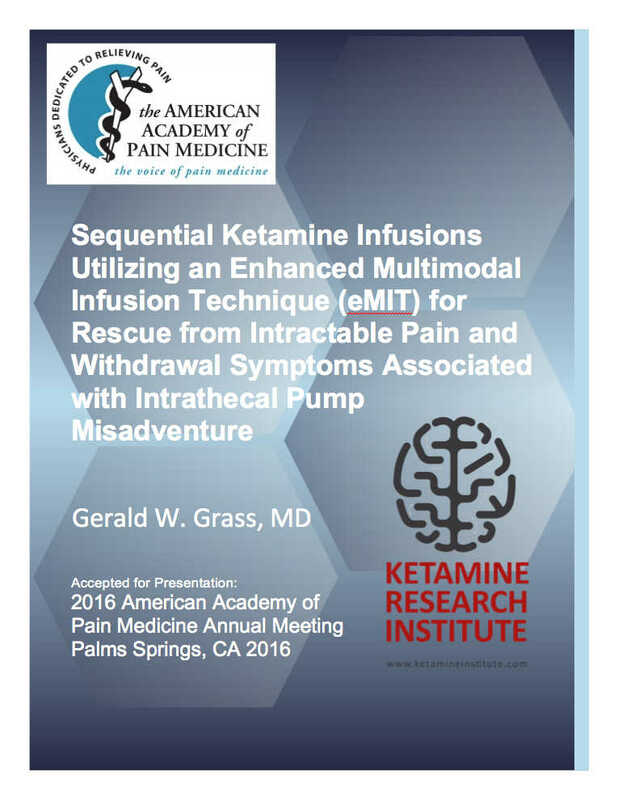 Dr. Grass has spent many years working to enhance and expand the benefits of ketamine infusion therapy. 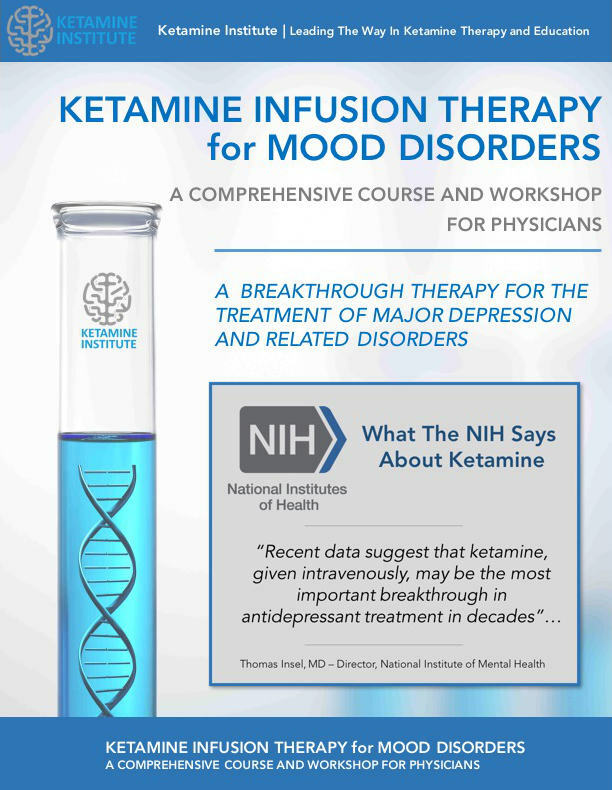 He has developed the RESTORE Ketamine Infusion to help relieve the suffering of patients with chronic pain and depression. He has presented his breakthrough work in regional and national meetings and conferences, as well as, to other physicians and governmental organizations around the country. 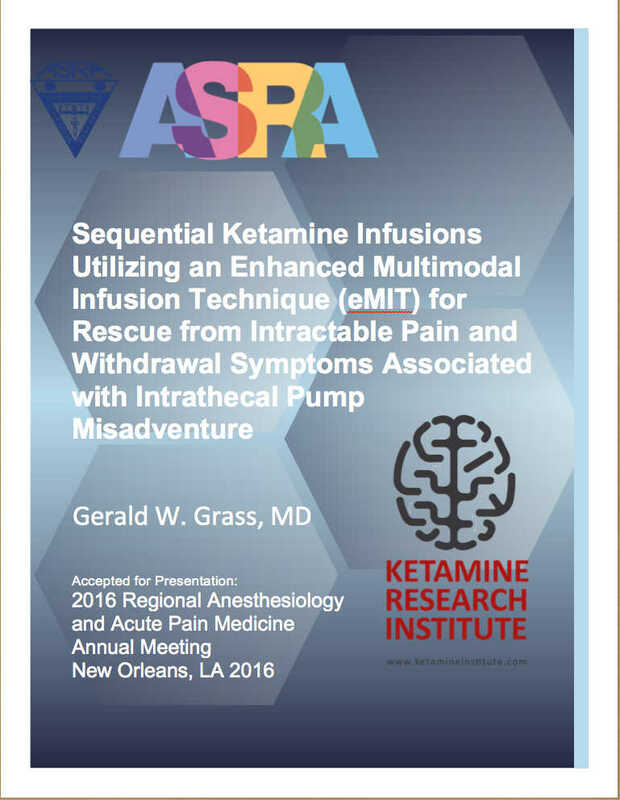 Dr. Grass is often sought out by major medical centers, research institutions and other physicians for his expertise and experience in the area of ketamine therapy. Broadly trained, he has extensive clinical experience and training in many fields of medicine including Anesthesiology, Neurosurgery, Emergency Medicine and Alternative/Complementary Medicine. All of which have served to give him the overview and training necessary to integrate the complexities of modern medicine and transform those fields into the emerging new direction in science known as Translational Medicine. 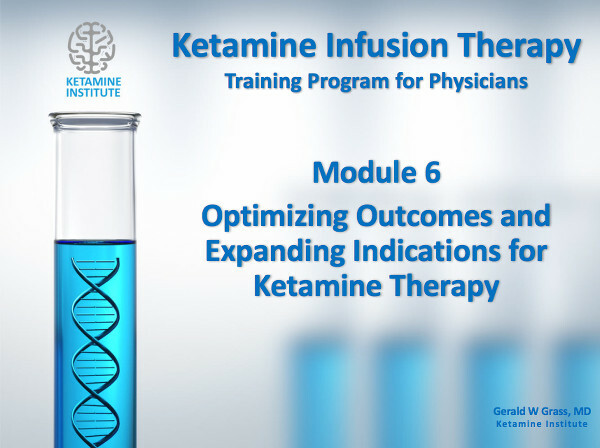 This comprehensive program, developed over 15 years, is the only training course for physicians that meets or exceeds the American Psychiatric Association consensus recommendation for ketamine therapy and the American Society of Anesthesiology guidelines for monitoring and airway management requirements. Gerald W. Grass, MD and The Ketamine Institute is leading the way in the field of ketamine infusion therapy and physician education with our new ketamine infusion training program. We’re on a mission to accelerate the health care revolution. 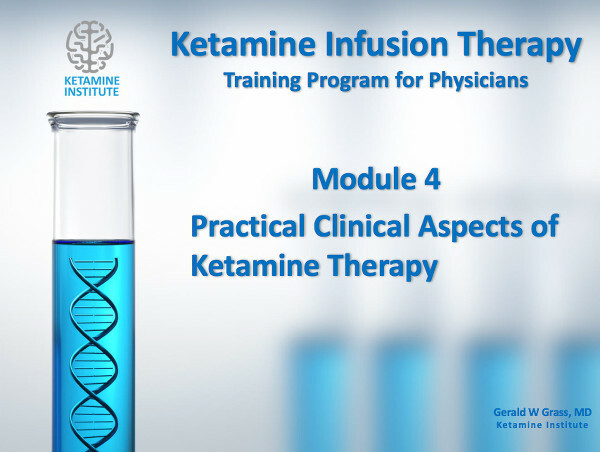 We have pioneered ketamine infusion therapy to bring the latest breakthrough discoveries about ketamine out of the research lab and into a physician’s office near you. 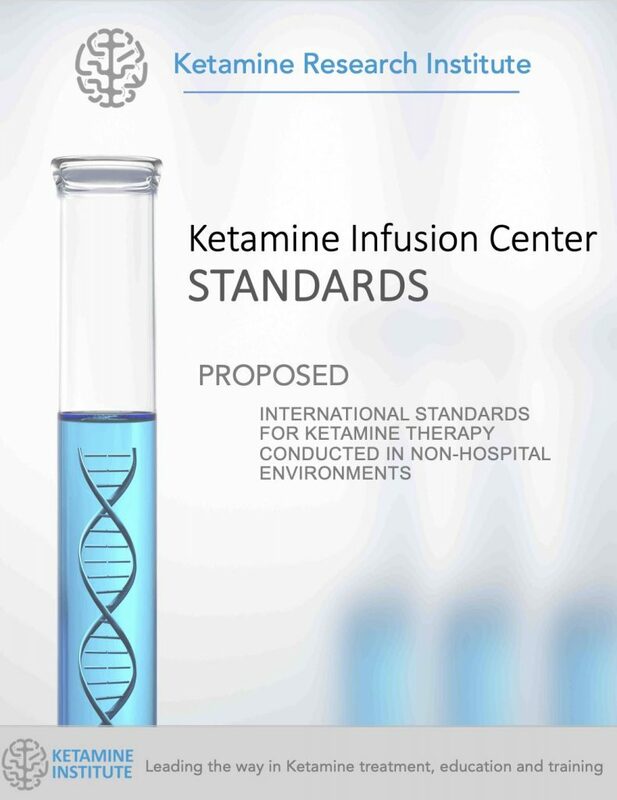 Research into other Ketamine Like Compounds - Will They Be Effective? 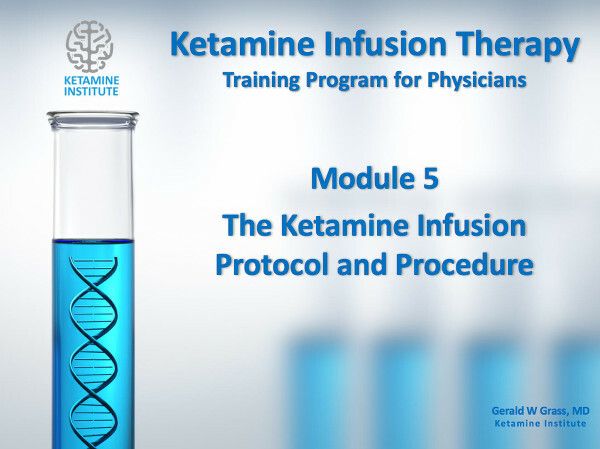 Contraindications to Ketamine Therapy - What are They? 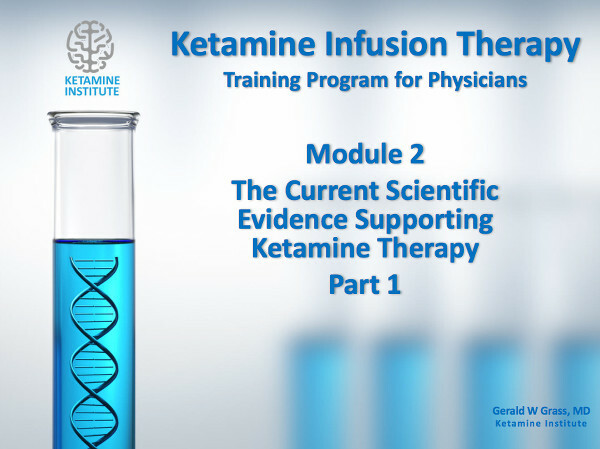 Is Ketamine Abuse and Substance Dependence an Issue? 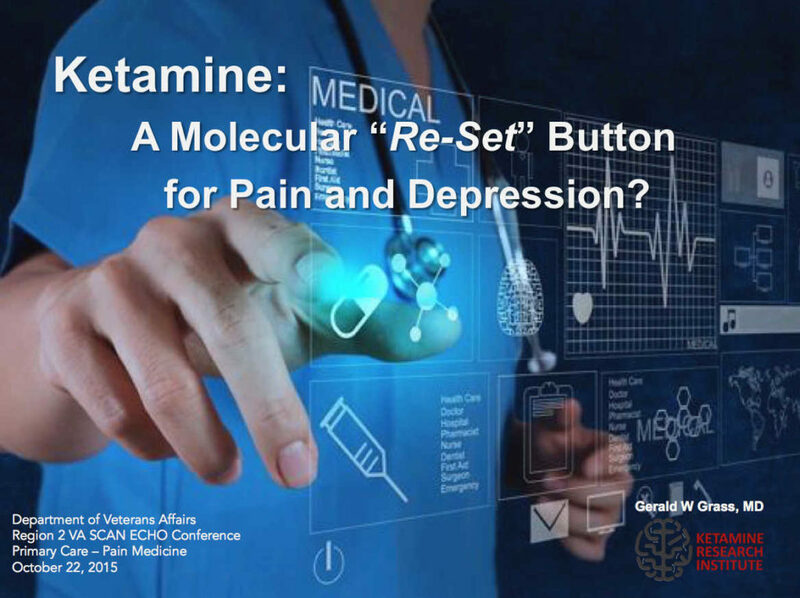 2015 – Grass G: Ketamine: A Molecular “Reset Button” for Chronic Pain and Depression. Region 2 VA SCAN-ECHO Telemedicine Presentation. VISN 5 - VISN 8 Primary Care Providers, September 2015. 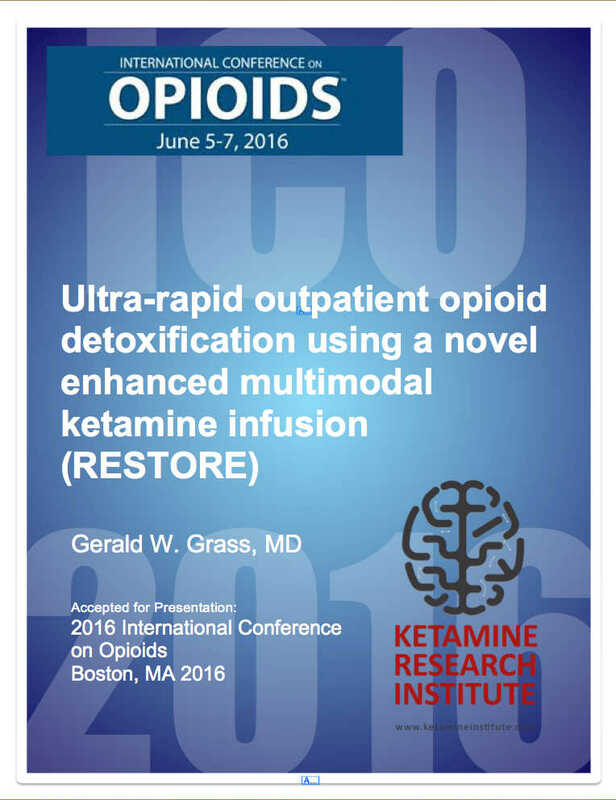 2015 – Grass G: Ketamine Intravenous Therapy for the Treatment of Chronic Pain. 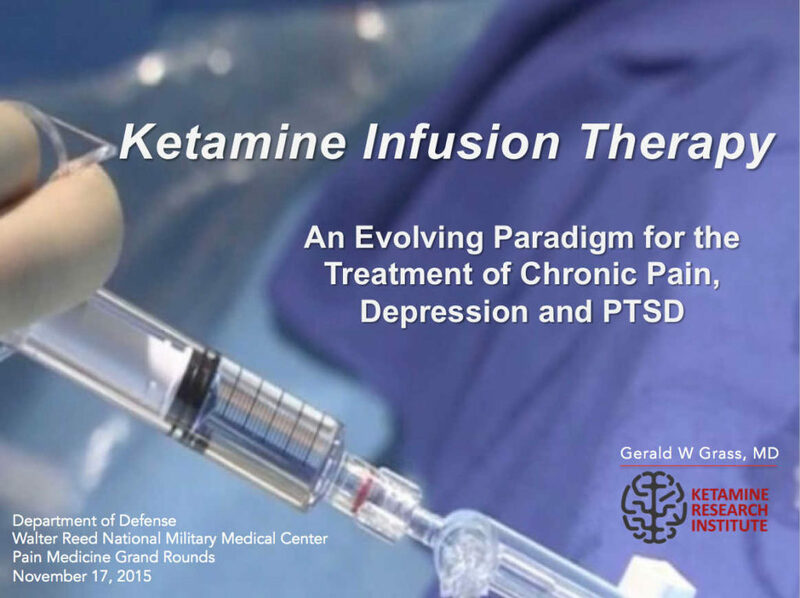 Department of Defense - Walter Reed Medical Center Pain Management Grand Rounds. November 2015. Grass, GW. 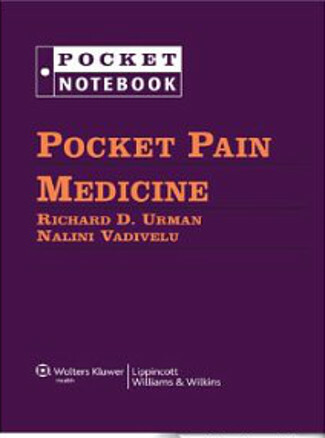 Neuropathic Pain in Pocket Pain Medicine. Vadivelu, N and Jahr, J eds. Lippincott, Williams & Wilkins, 2011. 2005 – Rozen D, Grass GW: Interventional Pain Medicine Approaches to Nonradicular Low Back Pain of Internal Disc Degeneration Origin. Pain Physician. 2005; 8:357-363. 2005 – Rozen D, Grass GW: Intradiscal Electrothermal Coagulation and Percutaneous Neuromodulation Therapy in the Treatment of Discogenic Low Back Pain. Pain Practice. 2005, Volume 5/Issue 3: 228-243. 2010 – Souzdalnitski, D, Grass GW: Nicotine Transdermal Patch For 48 Hours After Hysterectomy May Save Up To 77.6 Million Dollars Yearly: A Primer Of Concealed Economic Benefits Of Postoperative Opioid Sparing. 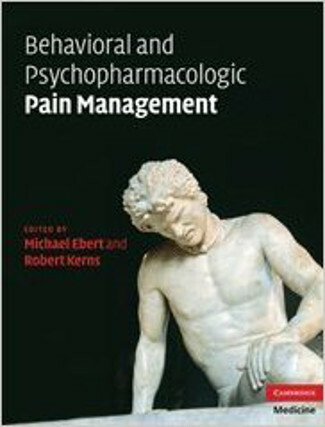 Presented at the 26th American Academy of Pain Medicine San Antonio, Texas on February 3-6, 2010. 2009 – Implementation of a Multidiscplinary Pain Medicine Center – VHA National Conference, Evolving Paradigms, Las Vegas, Nevada September 21-25. 2006 – Grass GW: A Novel Therapy in the Treatment of Recalcitrant Trigeminal Neuralgia: A Case Report – 22nd Annual meeting of the American Academy of Pain Medicine February 23-25, 2006, San Diego, CA. 2006 – Grass GW: Percutaneous Neuromodulation Therapy: A Novel Treatment for Intractable Abdominal Pain: A Case Report – 25th Annual Scientific Meeting of the American Pain Society (IASP Chapter) May 3-6, 2006, San Antonio, Texas. 2005 – Thompson JC, Grass GW, Kelly J, Paticoff J: A Challenging Case of Postherpetic Neuralgia: Its Multiple Treatment Options – 79th IARS Clinical and Scientific Congress. March 2005. Honolulu, Hawaii. 2004 – Grass GW: A Minimally Invasive Technique for the Treatment of Acute and Chronic Pain – The 58th Postgraduate Assembly – The New York State Society of Anesthesiologists. December 2004 New York, New York. 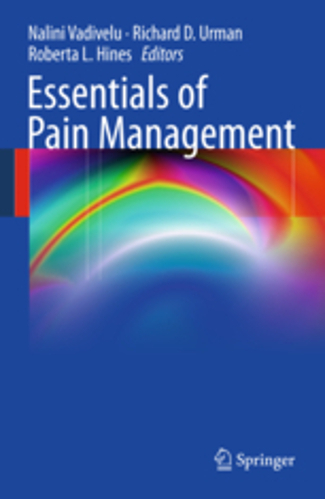 2004 – Grass GW: Percutaneous Neural Modulation Therapy: A Minimally Invasive Technique for the Treatment of Acute and Chronic Pain – The 2nd Joint Scientific Meeting of the American Pain Society and the Canadian Pain Society. May 2004 Vancouver, B. C.
2009-2013 Donaghue Foundation Program for Research Leadership Grant.” Implementation of a “Stepped-Care” Model of Pain Treatment”. R.D. Kerns (Principal Investigator). Total amount of award, $800,000. 2008-2010 VA Rehabilitation Research and Development Program Merit Grant (B6044R), “Cognitive behavior therapy for diabetic peripheral neuropathic pain”. R.D. Kerns (Principal Investigator). Total amount of award, $750,000. 2010- 2012 VA Connecticut Pilot Study: The Use of Transcranial Magnetic Stimulation in the Treatment of Chronic Pain States. G.W. Grass (Principal Investigator). Therapy for the Treatment of Mood Disorders. 2012 – Bellmore W, Grass G: Complex regional Pain Syndrome – Part 2. Region 1 VA SCAN-ECHO Telemedicine Presentation. VISN 1 through VISN 4 Primary Care Providers, August 2 nd. 2012 – Grass G: Medicolegal Aspects of Pain Medicine – Part 2. Region 1 VA SCAN-ECHO Telemedicine Presentation. VISN 1 through VISN 4 Primary Care Providers, June 21st. 2012 – Grass G: Region 1 VA SCAN-ECHO – A Transformational Approach To Specialty Care Consultation - Presented to the VISN 1 and VISN 2 Leadership Group for VA Redesign, June 11th. 2012 – Grass G: Medicolegal Aspects of Pain Medicine – Part 1. Region 1 VA SCAN-ECHO Telemedicine Presentation. VISN 1 through VISN 4 Primary Care Providers, June 7th. 2012 – Grass G:L Pain Medicine for Primary Care – Presented to the Center of Excellence Group for Primary Care Education at VISN 1, May 6th. 2012 – Grass G: Interventional Options in Pain Medicine. Region 1 VA SCAN-ECHO Telemedicine Presentation. VISN 1 through VISN 4 Primary Care Providers, March 1st. 2012 – Grass G: Radiological Anatomy “What is that Radiologist Talking About”. Region 1 VA SCAN-ECHO Telemedicine Presentation. VISN 1 through VISN 4 Primary Care Providers, February 16th. 2012 – Grass G: Low back Examination Techniques. Region 1 VA SCAN-ECHO Telemedicine Presentation. VISN 1 through VISN 4 Primary Care Providers, February 2nd. 2012 – Grass G: Introduction to Chronic Spinal Pain. Region 1 VA SCAN-ECHO Telemedicine Presentation. VISN 1 through VISN 4 Primary Care Providers, January 19th. 2012 – Grass G: Pain is Pain…or is it? Region 1 VA SCAN-ECHO Telemedicine Presentation. VISN 1 through VISN 4 Primary Care Providers, January 5th. 2011 – Grass G: MRI Findings and Pain Plan of Care Development. Region 1 VA SCAN-ECHO Telemedicine Presentation. VISN 1 through VISN 4 Primary Care Providers, November 3 rd. 2011 – Region 1 VA SCAN-ECHO – A Transformational Approach To Speciality Care Consultation - Presented to the VISN 1 and VISN 2 Leadership Group for VA Redesign, June 11th. 2011 – Pain Medicine for Primary Care – Presented to the Center of Excellence Group for Primary Care Education at VISN 1, May 6th. 2011 – Pain Medicine Survival Guide – Presented to the Primary Care Service of VA Connecticut at an educational forum sponsored by the PRIME Center and the Donaghue Research Foundation, March 31th.